Is a rapid, one step screening test for the simultaneous detection of Creatinine, Nitrite, Glutaraldehyde, pH, Specific Gravity, and Oxidants/Pyridinium Chlorochromate (PCC) in human urine. The One Step S.V.T. is a semi-quantitative, color comparison screen for the detection of creatinine, nitrite, glutaraldehyde, pH, specific gravity, and oxidants / pyridinium chlorochromate (PCC) in human urine. Each of the plastic strips contains six (6) chemically treated reagent pads. One (1) minute following the activation of the reagent pads by the urine sample, the colors that appear on the pads can be compared with the printed color chart on the canister. The color comparison provides a semi-quantitative screen for creatinine, nitrite, glutaraldehyde, pH, specific gravity, and oxidants/pyridinium chlorochromate (PCC) in hum an urine which can help assess the integrity of the urine sample. The test is based on the color derived from the chemical reaction between the chemical reagent on each test pad and the urine sample. The adulteration strips should remain in the sealed canister until use. Store as packaged in the sealed canister at 15-30°C. The test strips must remain sealed in the canister until use. DO NOT FREEZE. Do not use beyond the expiration date. Avoid direct exposure to sunlight. The urine specimen must be collected in a clean and dry container. 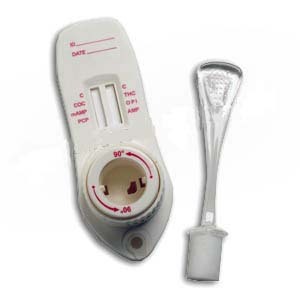 Test urine as soon as possible after collection. Allow the adulteration strip to equilibrate to room temperature (15-30 C) prior to testing. Remove the strip(s) from the canister and recap tightly. Dip test strip into the urine specimen and remove immediately. Blot the test gently on its side to remove excess urine. NOTE: It is important to blot the test strip for consistent results. Read results in one (1) minute by comparing each pad with the color chart printed on the canister. Do not interpret test results after 4 minutes. If the test indicates adulteration, refer to your Drug Free Policy for guidelines on handling adulterated specimens. Semi Quantitative results are obtained by visually comparing the reacted color blocks on the strip to the printed color blocks on the canister. No instrumentation is required. Control standards are not supplied with this kit. However, it is recommended that positive and negative specimens or controls be tested as good laboratory practice to confirm the test procedure and to verify proper test performance. The adulteration tests included with this product are meant to aid in the determination of abnormal specimens. While comprehensive, these tests are not meant to be an "all-inclusive" representation of possible adulterants. Nitrite: Nitrite is not a normal component of human urine. However, nitrite found in urine may indicate urinary tract infections or bacterial infections. Nitrite levels of > 20 mg/dL may produce false positive glutaraldehyde results. Tietz NW. Textbook of Clinical Chemistry. W.B. Saunders Company. 1986, 1734. Cody, J.T., Specimen Adulteration in drug urinalysis. Forsenic Sci. Rev., 1990, 2:63.